What is a Ground-Fault Circuit Interrupter? Checking around your home, you’ve probably noticed the outlets in your bathroom, kitchen, crawl space and outdoor receptacles have a “Test” and “Reset” button in the center and possibly a small, square light which is constantly illuminated. 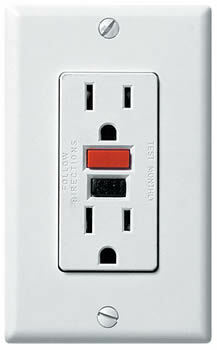 This type of outlet is a Ground-Fault Circuit Interrupter (GFCI). Invented in the early 1960’s at the University of California, the GFCI outlet spends the majority of its life monitoring the difference of current flowing in and out of an appliance. As an example – that blender or hairdryer you leave plugged in is being monitored by the GFCI for differences of power measured in milliamps. These differences are the imbalance of current between the hot and neutral conductors of a given circuit. If the difference exceeds 5 milliamps, the GFCI “trips” and shuts off the flow of electricity. GFCI’s are required by the National Electric Code in a number of rooms of your home – including all new kitchens, crawl spaces, unfinished basements and most outdoor receptacles. Think of it this way – if your outlet will be near any source of water, it needs to be a GFCI. There are two types of permanent GFCI receptacles: Once which is installed in the electrical panel of a home and, the more common, receptacle type that installs in a normal outlet box. However, some newer hair dryers may have them built in to their power cord or on the device itself. GFCI receptacles that always trip, cannot be reset or that were installed without the supervision of an electrician can be dangerous. If you’ve just moved in to your home (especially an older home) or are uncertain if your GFCI receptacles are operating properly – always consult an electrician. Copyright 2018 United Electric Company Inc.